Given good weather, the season’s first flight to monitor North Atlantic right whales off the coast of Georgia and Florida will take off Saturday. However, the imperiled whales apparently beat searchers to the punch. A boater off Hilton Head Island, S.C., photographed the first mother and calf of the season on Nov. 27, said senior wildlife biologist Clay George of Georgia DNR's Nongame Conservation Section. "We've received other reports of right whales offshore of Georgia and Florida, too,” added George, the agency’s lead researcher for North Atlantic right whales. All of which puts the species’ annual migration to its only known calving areas – along Georgia, northern Florida and South Carolina – right on time. The bigger question for 2012-2013 is how many whales will come, and how many will be born. Only seven calves were documented during the previous winter, and at least one of those died. 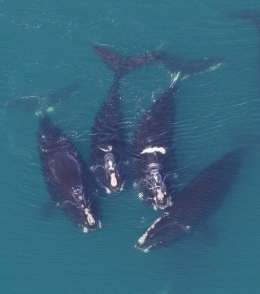 Six calves marks a 10-year low for a population that numbers about 450 whales. The annual average over the past decade is closer to 20 calves. Totals for non-breeding whales spotted were also off in 2012: 61 compared to 120 in 2010-2011. Those dips mirror lower counts the past three summers in the Bay of Fundy, a key foraging ground. Lower levels of copepod plankton in the bay may be a factor. Right whales are filter feeders, using bristle-like baleen in their mouths to sift tiny copepod prey from the surrounding ocean water. George said it’s impossible to predict how any calving season will go. Yet he is hopeful. With Georgia/Florida flights starting this weekend, and monitoring off South Carolina already underway, the picture for right whales this season will soon become clearer for researchers in the air and on the water. Why so few? Historically, commercial whaling decimated North Atlantic right whale populations. Slow, found close to shore and rich in blubber, these whales were considered the “right whale” to hunt. Ship strikes and entanglement in fishing gear are now the prime threats. Have we seen this before? A similar decrease in calving was documented in the late 1990s when only 11 calves were born during a three-year period. 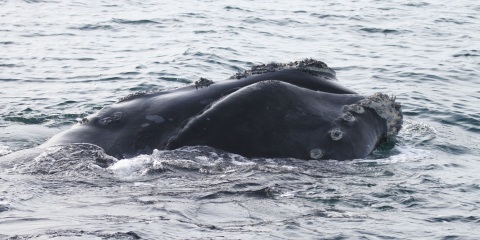 Watch our Flickr site for photos of right whales seen this season! Giving is big this time of year. 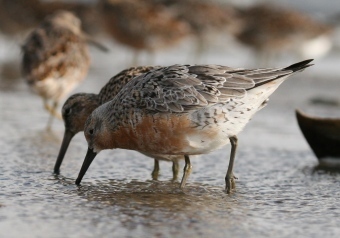 But who gives to conserve Georgia’s rare animals, plants and natural habitats, from right whales to red knots? Buy or renew a Give Wildlife a Chance license plate. Contribute through the Wildlife Conservation Fund state income tax checkoff. Donate directly to the Wildlife Conservation Fund. Or join TERN, friends group of DNR’s Nongame Conservation Section. There are other ways to support conservation of wildlife and wild places. But it’s worth noting that the Nongame Conservation Section’s primary mission is to conserve these creatures and the ecosystems they need. As an agency, we receive no state appropriations for this work. We depend on direct contributions, fundraisers and grants. That means we depend on you. Conserve animals such as loggerhead sea turtles – now on a 25-year nesting high – and bald eagles. 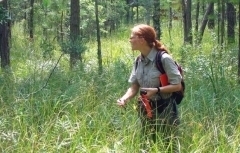 Restore rare habitats, like longleaf pine/wiregrass ecosystems at Doerun Pitcherplant Bog Natural Area in Colquitt County and native grasslands at Panola Mountain State Park in Rockdale County. Acquire wildlife lands, including Silver Lake Wildlife Management Area near Bainbridge and Paulding Forest WMA near Dallas. Raise awareness of Georgia’s nongame animals and native plants through public outreach and regional education centers that see more than 50,000 people a year. As you check your Christmas lists or think ahead to filing your 2012 taxes, remember that some of the things you treasure most about Georgia are not bought. Yet they depend on your support and that of others to thrive. And even to survive. Wildlife plates: Each time you buy or renew a bald eagle or a hummingbird license plate, you not only provide $10 for the state Wildlife Conservation Fund, you help raise awareness of the cause and show your support in way that’s visible and personal (as close as your bumper). Wildlife Conservation Fund income tax checkoff: It’s line 26 on the state’s long tax form (Form 500) and line 10 on the short form (Form 500EZ). E-filers and those who use a tax preparer can also give (download a request letter for preparers here). Contributions are deductible to the extent allowed by law. Any amount large or small helps! Direct contributions: As 2012 comes to a close, learn more about year-end donations and other gifts at www.georgiawildlife.com/conservation/support. Or call us at (770) 761-3035 or (478) 994-1438. TERN: Founded in 1992 to support DNR’s nongame conservation work, this nonprofit funded more than $62,000 in projects this year. Those projects varied from gopher tortoise research to the popular statewide Give Wildlife a Chance poster contest. Details. More than 1,000: Georgia plant and animal species listed as species of conservation concern. 1-for-4: Using match for grants, the Nongame Conservation Section gains about $1 in grants for every 25 cents spent from the Wildlife Conservation Fund. 37,000: Acres of Altamaha River-area wildlife habitat acquired for conservation, all of it open for other recreation such as hunting. Thousands more acres have been acquired across the state. Southwest Georgians glimpsed Operation Migration’s flight of endangered whooping cranes as the five young birds following an ultralight flew by last week (video). The cranes spent the night in Decatur County, then left for St. Marks National Wildlife Refuge in Florida, the end of the birds’ first migration south. 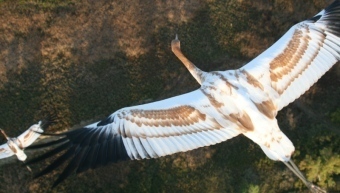 There are 115 whooping cranes in the wild in eastern North America, thanks to Whooping Crane Eastern Partnership efforts to restore the species to its historic range. Bats recovering from white-nose syndrome show evidence of another syndrome – one also linked to HIV-AIDS. White-nose is a disease that has killed millions of bats; immune reconstitution inflammatory syndrome is a sometimes fatal over-reaction of the immune system never before observed outside a clinical setting. The possible occurrence in bats could help scientists understand how white-nose affects bats, and prove important for AIDS treatment studies, say the U.S. Geological Survey and National Institutes for Health. 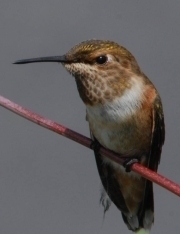 Hummingbird lovers who want to keep their feeders up in winter may be asking: How do we keep feeders from freezing? Here are three options: Take the feeder inside at night when temperatures fall below 26 degrees (the 1 part sugar to 4 parts water mix won’t freeze until then); focus a 150-watt outside flood lamp with an “alligator” clip on the feeder during sub-26-degree weather; or, wrap the feeder with a 3-foot-long electric heat tape. In Congress, The Sportsmen’s Heritage Act of 2012 failed a recent Senate vote and remains on the bubble. The bipartisan legislation is a compilation of 17 bills that supporters say will promote and preserve the nation’s hunting, shooting and conservation heritage. The latest sticking point is an estimated $132 million in new spending that would be financed by an increase in duck stamp prices but, according to some senators, would violate spending caps in budget legislation. The Farm Bill is also in limbo, a status that includes efforts to pass a five-year bill or extend the law that expired Sept. 30. The wide-ranging legislation, technically the Agricultural Reform, Food and Jobs Act of 2012, could provide nearly $1.6 billion for perpetual conservation easements, according to Land Trust Alliance. Etheostoma jimmycarter? Five newly discovered darter species in the eastern U.S. have been given names that ring of the White House. St. Louis University professor Richard Mayden and Steven Layman of Geosyntec Consultants in Kennesaw described the new Etheostoma species in the Bulletin of the Alabama Museum of Natural History, saying they named the fish after presidents Theodore Roosevelt, Jimmy Carter, Bill Clinton and Barack Obama and Vice President Al Gore because those leaders promoted conservation and the environment. Skidaway Audubon has been awarded the 2012 Outstanding Civic Organization Grand Award from the Georgia Urban Forest Council. The group was recognized for its project to remove highly invasive Chinese tallowtree, work dating to 2007 and now involving more than 1,600 volunteers. Seasonal speed restrictions for vessels 65 feet and longer have kicked in to protect North Atlantic right whales near the Savannah, Brunswick and other southeastern U.S. ports. To help ship operators, a new app called WhaleALERT overlays whale management measures and news of the latest whale detections on NOAA digital charts. A new “At-Risk Species Finder” on the website of the U.S. Fish and Wildlife Service's Southeast Region allows users to sort through species that are either candidates or petitioned for listing under the Endangered Species Act. The database can be downloaded here. 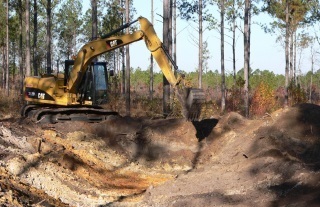 Three new ponds built by the Nongame Conservation Section will benefit gopher frogs and other wildlife at Fall Sandhills Wildlife Management Area in Taylor County. The shallow ponds (one is pictured below) will provide increased habitat for the frogs – which need temporal, fishless wetlands to lay their eggs – and rare plants. Some of 60,000 native grass plugs donated by The Longleaf Alliance will be planted around the ponds, adding to habitat restoration at Fall Line.